Get your Weather Radio at ACE Hardware DeForest! Name: Get your Weather Radio at ACE Hardware DeForest! 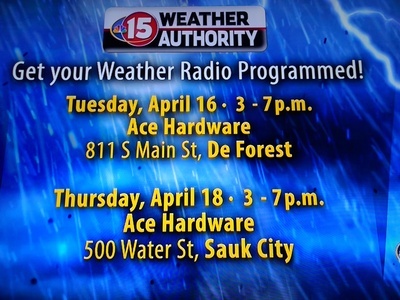 Get your Weather Radio Programmed or purchase one at ACE Hardware DeForest on Tuesday, April 16th from 3-7pm, WMTV will be there promoting the event!